Posted by I was hankering for some freshly baked pizza a few weeks back, so after picking up some fresh pizza dough balls from the Italian Market (available every Friday and Saturday morning - frozen ones easily defrost overnight in the fridge if they run out of the fresh stuff), I made a quick batch of scratch roasted tomato sauce to use on making pizzas on the weekend for brunch! 1) Preheat your oven to 350F. Slice up a whole bunch of tomatoes while it heats up. I like roma tomatoes, heritage tomatoes, heck, I've even used cherry tomatoes before.. use whatever you have on hand. Leaving the papery skin of the garlic head on, slice the root portion of the garlic head off. 2) Arrange sliced tomatoes on a lined cookie sheet lightly sprayed with olive oil. On separate lined pan lightly sprayed with olive oil, arrange whole garlic heads (with bottoms sliced off), then wrap up the garlic with the foil (erither individually or as a big foil packet, its not fussy). 3) Roast for 30-40 minutes until the tomato edges are starting to dry up - you don't it to burn! Carefully unwrap the roasted garlic (careful of the steam). Once its cool, squeeze out the soft roasted cloves to use as a spread, in sauces, or freeze for later! 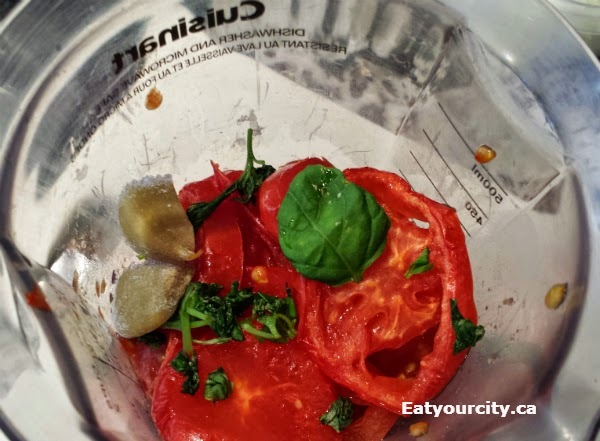 4) Blenderize the tomatoes and a few garlic (I used some I had frozen in my freezer) with fresh basil and season to taste.. I used my Cuisinart smartstick to puree it down... TAH DAH!